Allows admins other users with a specially-defined user-capability to define a custom menu on the admin-bar of his or her favorite shortcuts. Click here to download admin-bookmarks.zip. 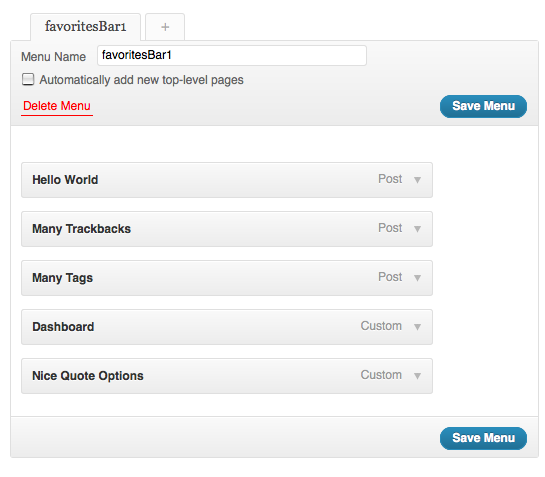 The Custom Admin-Bar Favorites free WordPress plugin is licensed under the GNU Public License v2.0 (GPL2). You are free to use and modify the plugin as you see fit. If you like my free plugins, feel free to donate. 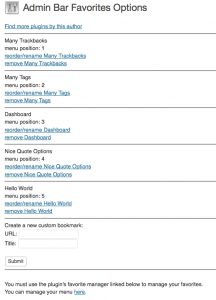 Doing so allows me to continue work on this and other great WordPress plugins, themes, etc. The plugin works fine on my website, however on my friends website at: http://pianotuningtucson.com/ there is a small annoyance. When clicking the plus sign to add a new admin link, the title of the website always gets added to the title and I have to edit each favorite. Any ideas on why and how to stop this? 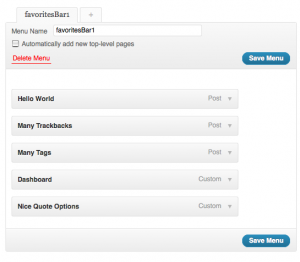 The Custom Admin-Bar favorites gets the title from the $title global variable. Unfortunately your theme changes the $title variable on all pages. Thanks for this great plugin! I have a small issue though. Every time I add a favorite it bounces me back to the dashboard. Is there a way keep me on the current page after I add it as a favorite? On the page it bounces you to, there is a link to the previous page. 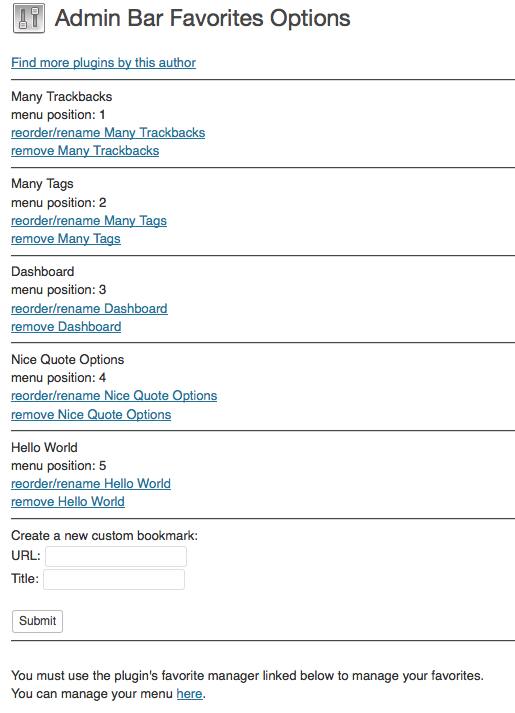 Hey Robert, I know this is an old post but can you ajaxify the plugin (so members can add bookmarks without being redirected off the page) and give support for WordPress Multi-site so it can be activated over the whole network and have one centralized are where the bookmarks are kept and allow members to type in custom links? Hey mate congrats on a really cool plugin! Sadly i have one issue with it… every time you add a favourite, remove a favourite, etc. It always redirects you to the back-end. Is it possible you could help me modify the code to make it not redirect after every command ? I don’t want members to have any access to the back-end, and it can be quite annoying for some users to have to keep redirecting themselves back to the site. Maybe this would be a great feature to add in the future… the ability to create and select the pages you want it to redirect to after every add, delete, command… ? Maybe just the option to disable redirect altogether… ? 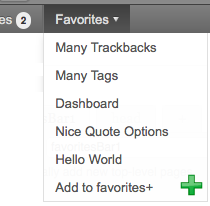 Just an idea I’m sure everyone that uses ‘Custom Admin-Bar Favorites’ will appreciate. If you could help me with this, it would be much appreciated! 🙂 Thanks in advance.